Well said! When I really struggle with riding, I have to remind myself of how bad driving my car is (and expensive). Struggle?! When the roads are really bad, I get off and walk my bike till I hit a clear stretch. It’s sooo much faster than walking, I can’t imagine getting around any other way, even in winter. 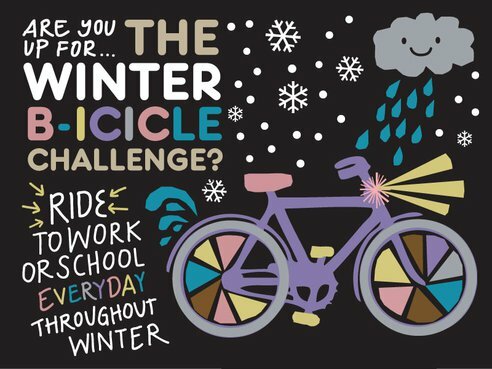 This year was my first real year of cycling rather bike riding, i.e the occasional pleasure ride, but so far I’ve been wimping out when it comes to cycling in winter. But it’s time to woman up and hop back on my bike. I accept the challenge. Good luck – It’ll be interesting to read on how this challenge goes, I’m sure of that! Hey Alex! I’ve been riding through it, don’t you worry. The wind has been more of an issue than snow or ice or cold. Brrr.